Moving on from performance metrics, we’ll touch upon power, temperature, and noise. This is also normally where we’d discuss voltages, but as Vega is a new chip on a new architecture, nothing seems to read Vega 64 and 56 correctly. In terms of average game clockspeeds, neither card maintains its boost specification at 100% with prolonged usage. 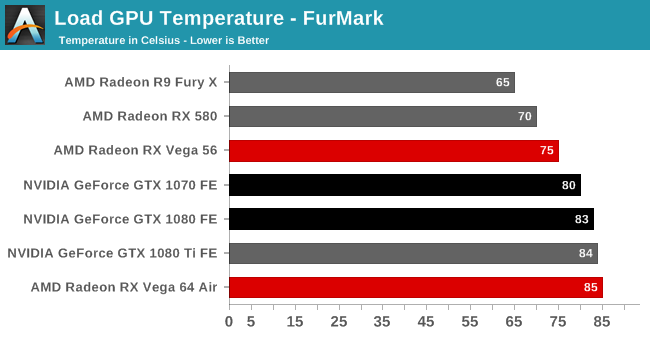 Vega 64 tends to stay closer to its boost clocks, which is in line with its additional power overhead and higher temperature target over Vega 56. With games, the HBM2 clocks ramp up and stay at their highest clock state. 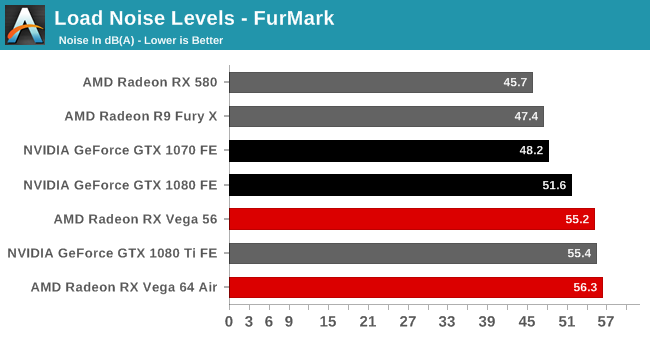 Expectedly, the strains of FurMark cause the cards to oscillate memory clocks: between 945MHz and 800MHZ for Vega 64, and between 800MHz and 700MHz for Vega 56. On that note, HBM2 comes with an idle power state (167MHz), an improvement on Fiji's HBM1 single power state. 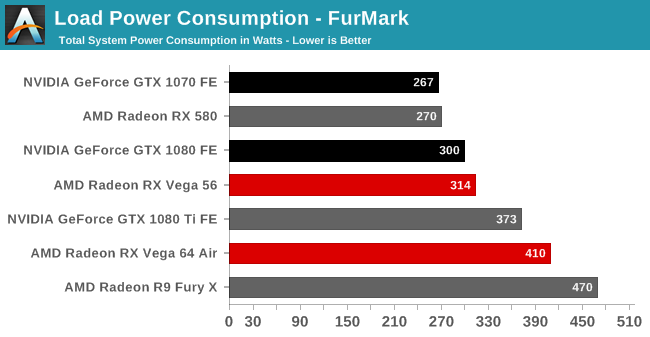 Unfortunately, the direct power savings are a little obscured since, as we will soon see, Vega 10 is a particularly power hungry chip. As mentioned earlier, we used the default out-of-the-box configuration for power: Balanced, with the corresponding 220W GPU power limit. 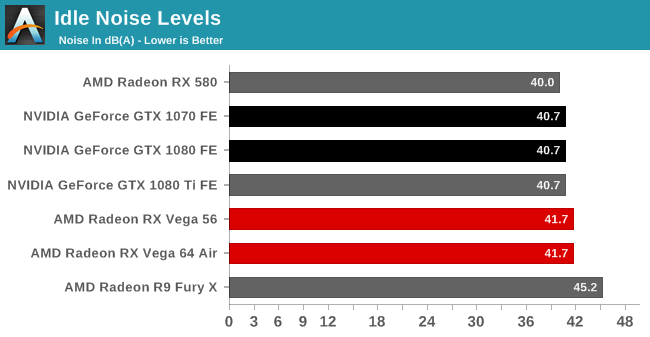 And under load, Vega needs power badly. The performance of both Vega cards comes at a significant power cost. 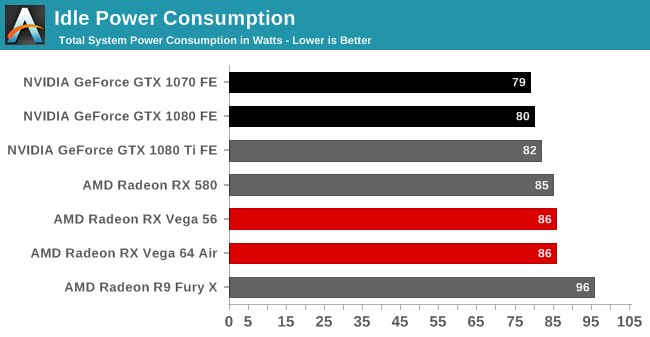 For the RX 500 series, we mused that load consumption is where AMD paid the piper. Here, the piper has taken AMD to the cleaners. 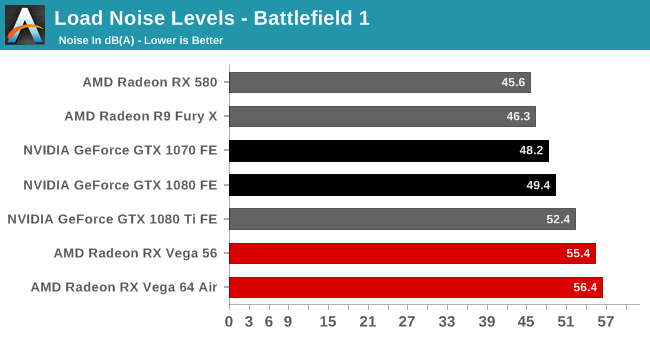 In Battlefield 1, Vega 64 consumes 150W more system-wide power than the GTX 1080, its direct competitor. 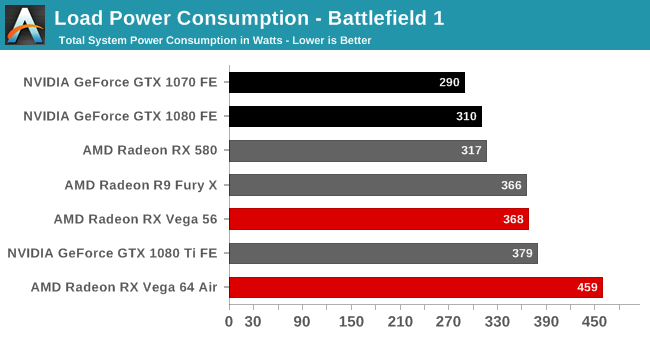 To be clear, additional power draw is expected, since Vega 64 is larger in both shader count (4096 vs. 2560) and die size (486mm2 vs. 314mm2) to the GTX 1080. But in that sense, when compared with the 1080 Ti, powered by the 471mm2 GP102, Vega 64 still consumes more power. 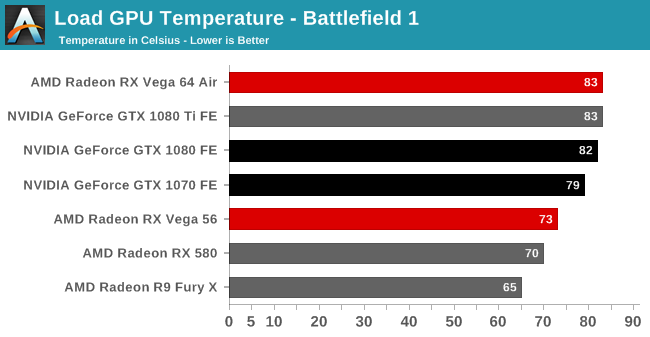 As for Vega 64's cut-down sibling, Vega 56's lower temperature target, lower clocks, and lower board power make its consumption look much more reasonable, although it is still well above the 1070. In any case, the cooling solutions are able to do the job without severe effects on temperature and noise. 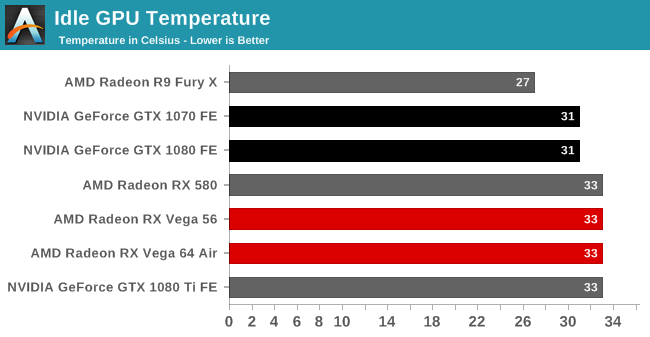 As far as blowers go, RX Vega 64 and 56 are comparable to the 1080 Ti FE blower. Noise-testing equipment and methodology differ from past results, with a more sensitive noise meter and closer distance to the graphics card. Readings were also taken with an open case. As such, the noise levels may appear higher than expected.